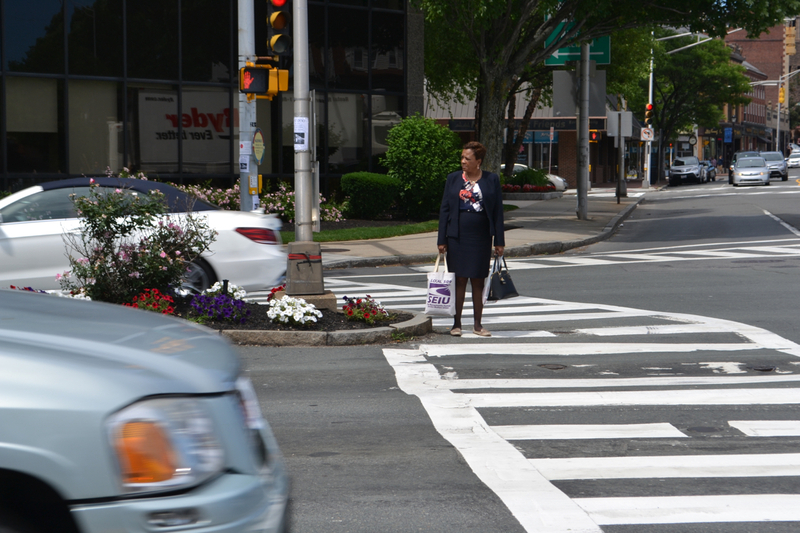 When traffic is heavy, Malden pedestrians cross streets at their own risk. However, there may be ways to make the city more pedestrian friendly. “They don’t care if they run you over” is one of the statements I’ve heard about traffic on the Fellsway East Road from Malden residents in my neighborhood. 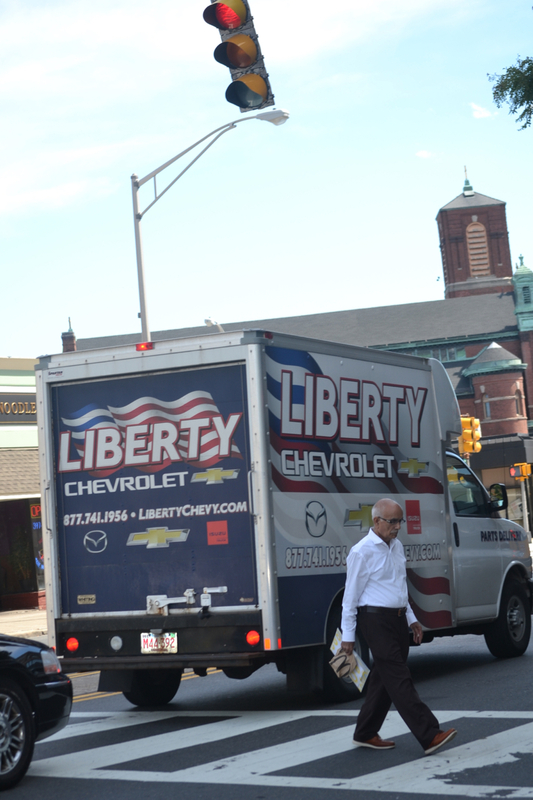 Many Malden residents feel the increase in traffic on their roads in recent years has made it less safe for them to walk in their own neighborhoods. This reshaping could be an opportunity to improve Malden’s pedestrian environment and to make walking safer for the community. Other cities, such as Minneapolis, can provide a blueprint of how a community can learn to leave the cars at home and get people on their feet. 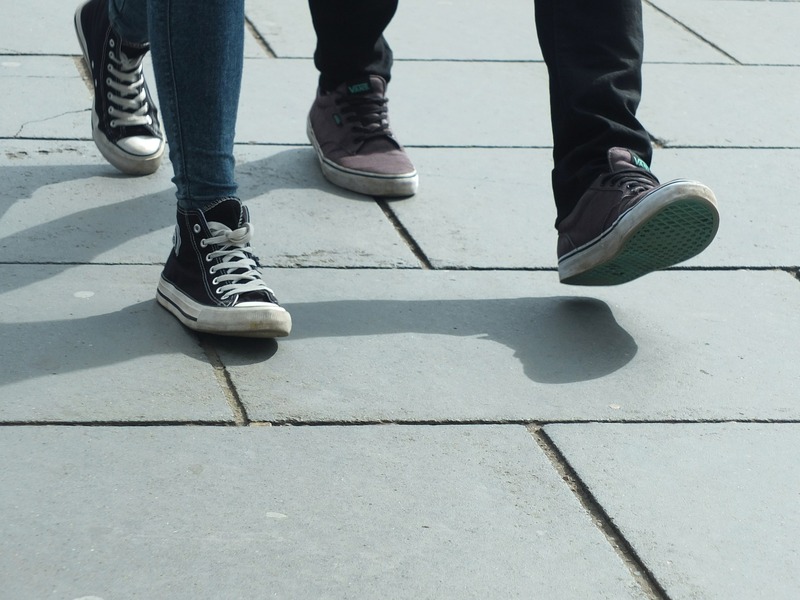 A study by the National Highway Traffic Safety Administration found that 20.9% of total traffic accidents in Massachusetts had pedestrian fatalities in 2013. If you compare this to Minnesota, a state with a comparable population and city design, you will find only 8.3% of traffic accidents had pedestrian fatalities. This study defined a pedestrian as any person on foot, walking, running, jogging or hiking. In another study from that same year, Malden had twice the number of pedestrians involved in fatal accidents as the Massachusetts average. How can this be changed? Let’s look at the situation in Minneapolis and compare it to that of Malden. In October of 2009, the city of Minneapolis, which includes the suburbs and surrounding cities, created a Pedestrian Master Plan with six goals The first goal was a well-connected walkway system. 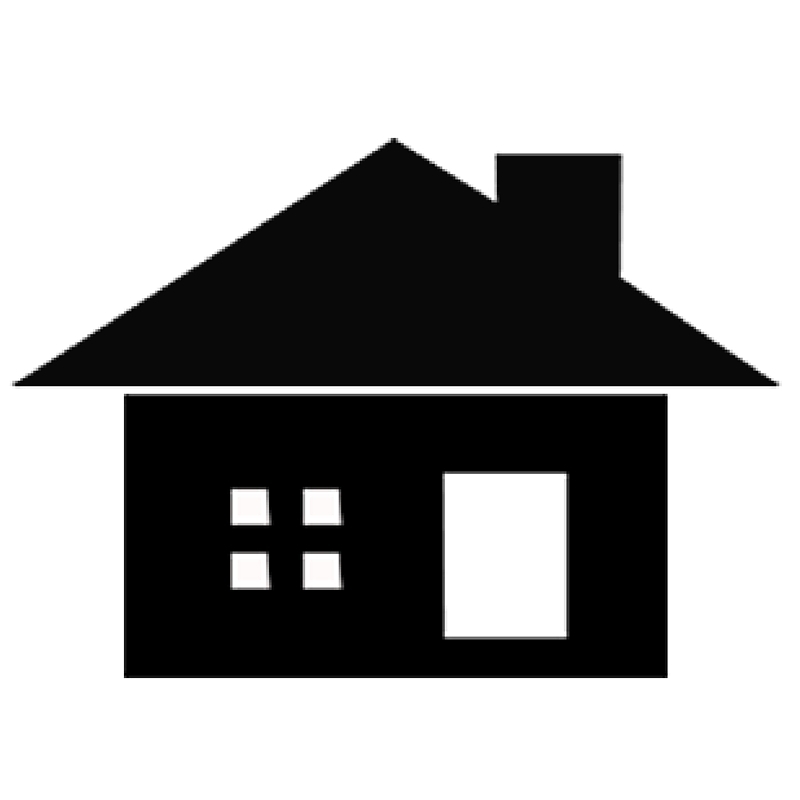 Malden has already created the bicycle/pedestrian trail that improved connectivity, the newer construction is creating wider sidewalks, and with the current downtown sidewalk system Malden’s citizens have access to many destinations. Goal two was accessibility for all pedestrians including those with disabilities, which is an ongoing goal for any city. Goal three was safe streets and crosswalks. This was a common concern for Minneapolis citizens, according to the Pedestrian Advisory Committee. Likewise, Malden has been working to achieve a similar goal in regards to the intersection of the Fellsway East and Highland Avenues, considered one of the area’s most treacherous intersections. The Massachusetts Department of Conservation and Recreation (MDCR) has proposed either a traffic light or a standard roundabout. 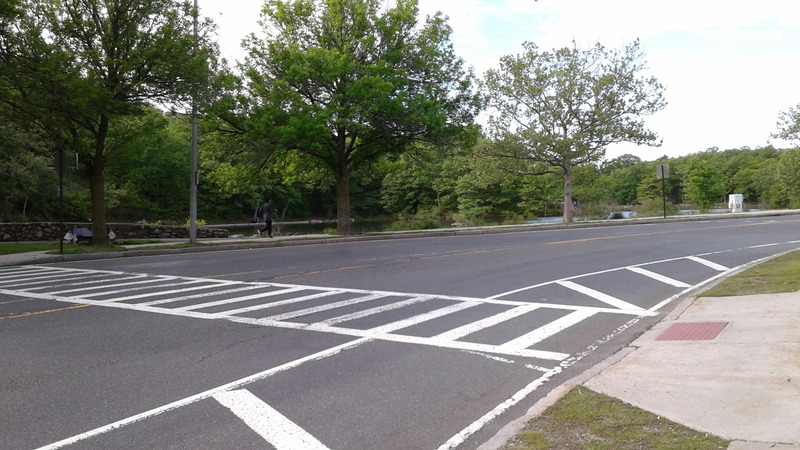 An article in Wicked Local by Aaron Leibowitz about the proposed changes reported that “Multiple parents said they would never let their kids cross the Fellsway East/Highland Avenue intersection to get to the Beebe School” due to current safety concerns. Curbside bike lanes are currently being considered as part of the standard roundabout option on the Fellsway proposed by the MDCR. Bike lanes would narrow the traffic lanes and slow traffic speeds. The Wicked Local article stated that the average speed was 40 miles an hour. The posted speed is 25 to 30 miles an hour. Goal four for Minneapolis was a pedestrian environment that fosters walking. 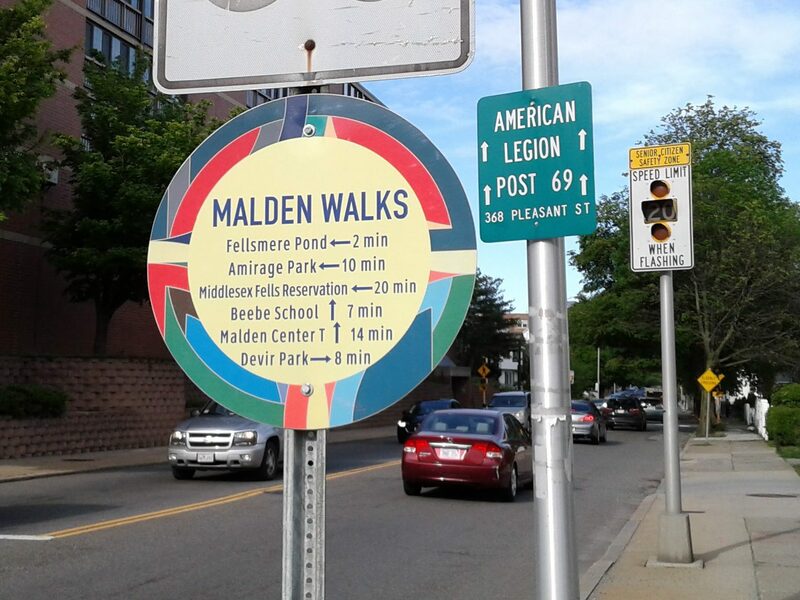 Malden has done this by creating “Malden Walks” signs. These signs were a collaboration with Malden Walkability Committee and the city to make Malden more walkable. If Malden streets were as empty as this, crossing the road would be easy. However, the city has to balance the needs of cars and pedestrians. Goal five was a well-maintained pedestrian system. This would involved removing ice and snow from sidewalks. Malden utilizes youth work programs for this during the winter season. Goal six was to create a culture of walking. In Minneapolis this goal was taken very seriously and was broken into three components: promote walking for youth, promote walking for adults and showcase and celebrate great walking experiences. To promote walking for youth, the plan was implemented through a subgroup called the International Safe Routes to School Movement. This worldwide movement believes that motivating children to walk to school will not only make them healthier but energize them and make them ready for learning in the morning. Walking will improve your health, numerous studies have shown. People who choose to drive not walk out of safety concerns may be creating create long-term lifestyle patterns. Walking is recommended by the American Heart Association and the National Institute of Diabetes and Digestive and Kidney Diseases to lower your risk of high blood pressure, diabetes, and high cholesterol. Increasing physical activity for children is an important health intervention that would impact not only the children’s health but have economic benefits as indicated by a study in Health Affairs. One of the initiatives to promote walking for adults was to give a $25 voucher for a free transit ride or cab for people who walked or biked at least three times a week to work. Maps of Minneapolis were created highlighting the great places to walk and fun runs and fun walks were held to showcase and celebrate great walking experiences. 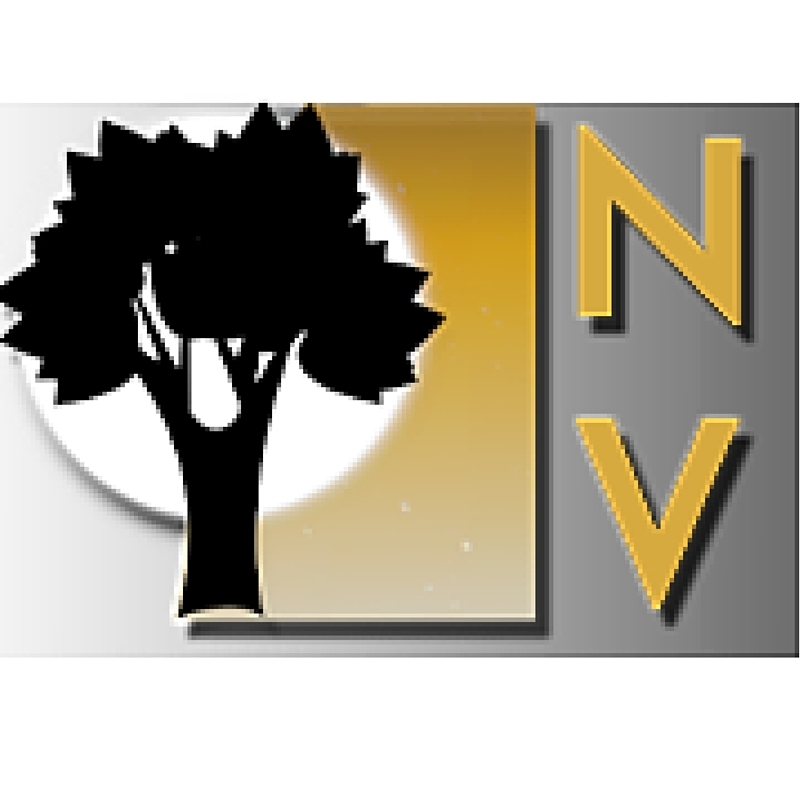 Many stakeholders implemented the plan including the Minneapolis Police Department, the Minneapolis Park and Recreation Board and the Minneapolis school systems. Bike walk ambassadors were also identified as stakeholders and the school district hired a part time coordinator. This coordinator held National Bike and Walk to School day events. The “Malden Walks” initiative seeks to encourage walking in the city. The colorful signposts were inspired by the art of internationally renowned artist Frank Stella, a Malden native. Creating this culture of walking in Malden would take time and effort as well as financing. Goal seven addressed that in finer detail “To implement improvements, the City needs to proactively prioritize pedestrian needs alongside other transportation needs and seek out the most cost-effective means of implementing pedestrian improvements citywide.” This meant improving students’ health through a school pedestrian safety program while acknowledging the disadvantage of requiring funding for overhead flashing lights or the cost of other safety features. The culture for walking must be created though infrastructure changes for safety. If pedestrians don’t feel safe, they won’t choose to walk. It takes a blended effort of proactive leadership and stable financing to pull off as great a change as this but the long term benefits and the possibility for success could be great for the city of Malden. Malden is off to a great start with the bike path, the Malden walks signs, and the larger sidewalks with the new construction and more could be done and should be to ensure a healthier Malden through walking. Thank you for this important piece. Reducing car speed is critical and this can be accomplished by strategic road/sidewalk design. I do want to add that part of the responsibility lies upon the pedestrians and cyclists. For instance, in the photo above of Route 60 and Main Street, the woman is crossing illegally against the pedestrian light. Everyone needs to comply with the rules of the roads. Pedestrians need to go a bit out of their way to use crosswalks at the end of a block. Bikes need to ride with the traffic flow. I say this as an avid walker and cyclist.